Alice in Wonderland met with such derision upon its theatrical release earlier this year I waited to address it until I could consider it further through its home release. See my knee-jerk reaction is it isn't all that bad (just as my initial gut reaction to Shutter Island—another film from earlier this year—contrasts from the consensus in how much I dislike it... look for my review of Island to finally arrive in the coming days). Because his imagery and production design are so transportive and so distinctly personal I often give Burton a pass on actual story content. With Alice I feel no need to. This is a surprisingly focused and coherent text built around a strong central performance by Australian actress Mia Wasikowska (so impressive on HBO's In Treatment). 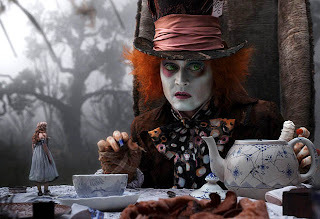 It improves on Burton's Beetlejuice (1988) by reframing its story around the young female lead instead of overindulging a jester-like character—in this case, Johnny Depp's Mad Hatter—which is wisely used here only in small doses (one huge flaw, though, is the Hatter's dissonant futterwacken moment, an anachronistic breakdance at the climax which threatens to jerk the viewer out of the film's otherwise tightly constructed dream world). This necessary adjustment becomes even more potent when one views Alice as a children's story, something I believe many reviewers were resistant to given the broader inclusiveness of adult perspectives in Burton's other movies. 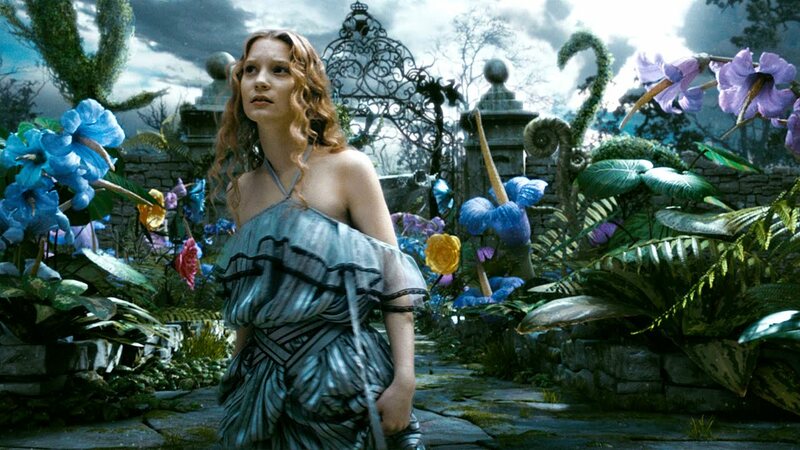 Wasikowska's development from a simple dreamer to reactor to enactor is a very nicely modulated performance reflected in the progressive changes of "Underland's" design throughout the film from playful surreality to the foreboding precision of a grim chessboard. The Blu-ray also enhances the experience in a way the 3D theatrical release failed (Alice in Wonderland is one of those films that was horribly converted to 3D post-production). It's image is cleaner and sharper without ever crossing the line into unnecessary edge enhancement. And it smartly utilizes its extra features to survey the strongest elements of the movie, its production design, makeup, and of particular interest, Ken Ralston's CGI work. Shifting gears to the Old West, The Man with No Name Trilogy made its debut on Blu-ray on Tuesday, June 1st (appropriately enough the day after Clint Eastwood's 80th birthday). The collection's title is a bit of a misnomer since Eastwood plays three different characters in each film, all with names, or aliases at least. The three movies are a bit of a mixed bag, with the quality of each Blu-ray disc strangely conforming to each film's level of excellence. Director Leone's first entry, A Fistful of Dollars (1964) is by far the weakest of the bunch. However that's not to say the film is bad. One can simply still detect Leone experimenting with the formal aspects which would come to define the "spaghetti western." Perhaps this is why he leaned so heavily on Kurosawa's Yojimbo (1961) (or even Hammett's Red Harvest some say) to provide the film with its text. What one feels most strongly in this one is the hallucinatory quality of the desolate landscape. Shot in the yellow desert of the Almería province in Spain, with adobe housing taking precedence over the more familiar wooden structures and ruddy terrain of domestic westerns, one immediately gets the sense of something askew. Eastwood's antihero, Joe, is an existential adjunct to his surroundings. Forget the fact that all the players seem to only live in the moment. They, and their setting, don't even seem to exist beyond the frame. It's as if there is a certain hollowness to the characters that makes them more signifiers or archetypes than anything else. Except there is a dark, passionate undercurrent running through the film best observed in the performance of Gian Maria Volontè as one of the nastier villains in the film, Ramón Rojo (an acknowledgement of Red Harvest?). Volontè gets an expanded role in For a Few Dollars More (1965), arguably the best of the bunch. 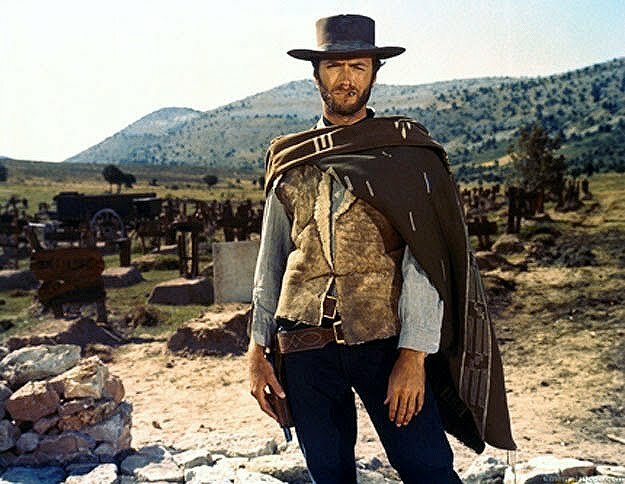 Here Eastwood plays a gunfighter named Manco who teams up with Lee Van Cleef's Colonel Mortimer to kill Volonte's Indio. While Manco is motivated by money, Mortimer's motive seems to be a deeper one. Ennio Morricone, composer on the first film, returns here with one of his strongest scores, one which infuses the film with signs of an interior life in the characters for the first time in the trilogy. This is particularly acute in the case of the haunted Indio, who always listens to a musical pocketwatch he carries before killing his intended victims. It is later learned how Morricone's pocketwatch theme binds Indio and Mortimer. The dreamscape in this entry is now not just a visual one (the desolation persists to some degree with characters only making an appearance if they serve a deliberate story purpose) but an aural one as well. Bonus points go to this film for casting Klaus Kinski in one of his twitchier turns as a hunchbacked henchman of Indio's. The Good, the Bad and the Ugly is the most popular of the films, mostly because of Eli Wallach's hilarious depiction of Tuco. It is a strong movie, no doubt, but it feels a bit bloated with many of Leone's tropes being layered a little too thick, i.e. the showdown between Tuco, Lee Van Cleef's Angel Eyes, and Eastwood's Blondie which is one of the lengthiest and most overwrought climaxes in the history of westerns. In this final chapter, Leone has moved beyond the chimeric to some degree incorporating historical events such as the Civil War. And the operatic emotion of Volontè is missed, although Wallach is fine in his role as comic relief. The Good, the Bad and the Ugly is the same Blu-ray released last year which has a softer transfer in terms of picture. But the picture quality on the first two films retain the original graininess, a good thing for those who appreciate these grittier, raw westerns. And neither fall prey to the distortions of edge enhancement. Unfortunately, as DVD Beaver points out in their own review, the first film suffers from a bit of overcropping on the bottom and right-hand side of the picture. But this writer found it far too minimal to count it as a knock against the final product. For a Few Dollars More looks the best it ever has, with less of a reddish tint in the skin-tones and a degree of beautiful color variation most evident in scenes shot at dusk, i.e. Mortimer's final departure from the film. All three movies feature the same extras present in their Special DVD Editions.